If you are one of my few treasured fans over on Facebook, then you may have already noticed the new logo I created. 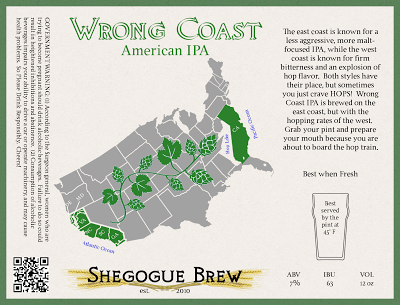 On most of my labels I had just been using this font to read "SHEGOGUE BREW" and I had some images of grain underneath it, It worked, but I wanted a logo that could stand alone. I put the symbol on the backburner to consider some sort of tagline. Many of the great breweries have them. i.e. Dogfish Head - "Off-centered ales for off-centered people". Everyone in my family knows I have two speeds slow, and slower so I came up with the tagline "slowly analyzing ales"
...woman who are trying to become pregnant SHOULD drink alc. beverages.?? wtf? Very beautiful logo! Of course this factor is very important for brand promotion and general appearance for customers. A lot of top localization companies use professional help for the marketing actions. If your company is big enough this option is the best one.